Watch Friday, April 17, 2015 at 7pm on WORLD. For the Escarcega family, their worst nightmare becomes a harrowing reality. Their newborn baby is slowly dying from congenital heart disease. Doctors tell them it’s the beginning of the end...unless a heart becomes available for transplant surgery. Life on the Line: Heart to Heart follows Baby David’s journey and reflects on the pioneering efforts of infant heart transplantation that took place 30 years ago with Baby Fae. The 2010 earthquake in Haiti brought utter destruction to the country. Trapped under the rubble for three days, 8-year-old Sebastian Lamothe is faced with the reality of losing his parents, his home, and his leg. Yet his courage prevails in the face of death inLife on the Line: Out of the Rubble. Child abuse is much more common than we think. The statistics are staggering, with one in four girls and one in six boys molested by the age of 18. Three individuals uncover their childhood secrets of abuse while clinicians share the dramatic the dramatic effect it has one a person's life. 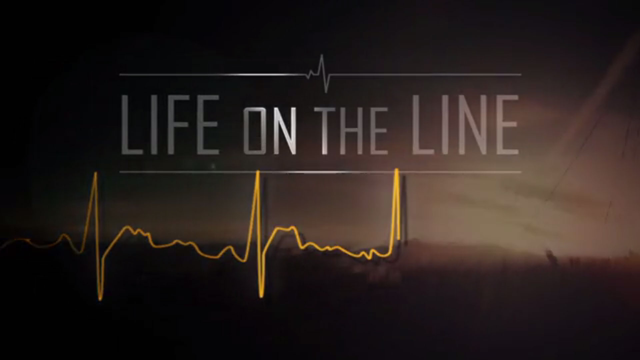 Life on the Line: End It Now raises awareness about this silent killer and explores the part we can play in prevention. Each year in Egypt alone, 20,000 children are diagnosed with congenital heart disease. Roukaia, a 2-year old girl from Alexandria, Egypt, received her death sentence the day she was born. On Life on the Line: Baby Blue, watch as doctors from opposite sides of the globe work together to save thousands of cyanotic children who are waiting in a line that is ultimately longer than their lifetimes. "One Arm Willie" Stewart is set to defy his physical limits while training for the physically challenged triathlon USA championships. Determined to help others with disabilities, this world-class athlete demonstrates that disability doesn't mean inability on Life on the Line: Armed for the Challenge. Access to healthcare is a challenge for many people living in the Amazon jungle. Antenor, a father of seven who supports his family by producing agriculture has been sick and not able to bring enough food home. In a different village, 4-year-old Felipe has a difficult time playing with his friends. His heart problem is getting worse. Watch Life on the Line: Anchoring Hope to see what happens next as a mission boat leaves a wake of hope.